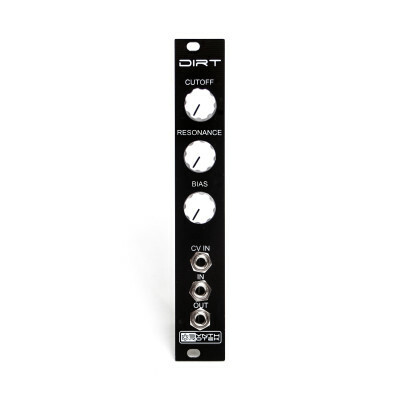 Inspired by one of our favorite ‘noisy’ filters, the DIRT is an unapologetic filter / effect that produces interesting and unique effects via the Bias knob, accessible from the front panel. It’s not a traditional filter; it’s an effects module with filtering, ring mod effects, wave shaping and even outright brutal harmonic distortion. – RESONANCE = Increase the Q! – CUTOFF CV IN = Voltage range changes depending on where CUTOFF knob is positioned. External attenuation will be needed for fine modulation. In version 2.2, the CV input is buffered. hi, i got only 10k audio pot, can it be used instead of that 5k?